Each city is split into different City Zones. 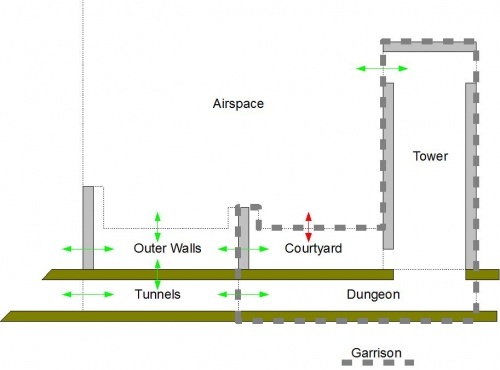 Possible zones include Airspace, Outer walls, Tunnels and Garrison. Not all cities have all types of city zones, and some may have some that aren't listed. However, each city must have a Garrison Zone. Furthermore, each City Zone may be split into different sub-zones. Airspace can only be entered by Flying units. Airspace can attack, or be attacked by, Tower garrison sub-zone. Outer Walls can contain a Gate sub-zone. Gates, while weaker than other sections of the wall, allow non-flying, non-tunnel capable units to enter and exit a city. Outer walls can also contain towers that boost its defensive value. It has yet to be seen if outer wall towers are a true sub-zone or an enhancement providing addition. Tunnels can only be entered by light Units or units with a natural ability allowing them to enter tunnels, like Spidews and Sourmanders. Tunnels can attack, or be attacked by, the dungeon garrison sub-zone. All cities have a garrison zone. When the garrison falls, so does the city. Garrisons can contain sub-zones. The Units defending a City are also called its Garrison. These Units are assigned the Garrison Ability. Courtyard can only be attacked from Outer Walls, and then only when the Garrison Walls have been breached. A tower can only be attacked from Airspace, which can only be entered by Flying Units. Towers sometimes have unique names, such as Minnow Tower (Goodminton), the Tower of Efdup (Gobwin Knob), and the Tower of Jenga (Jetstone). Dungeon can only be attacked from Tunnels, which can only be entered by light Units or a unit with a natural ability allowing it to do so. The Portal Room is located on this level in all all capital cities. Each city may have different Garrison sub-zones, depending on it's construction. For instance, a subterranean city wouldn't have an airspace and therefore, no tower. Similarly, not each garrison sub zone needs to connect to main city zone. A subterranean city might have a courtyard, but no outer walls. Spacerock is one such oddity, having dungeons but no tunnels (this is marked up to being the unique aspect that comes with being a Level 5 city) Erf-b2-p25 . This page was last edited on 25 August 2015, at 09:12.